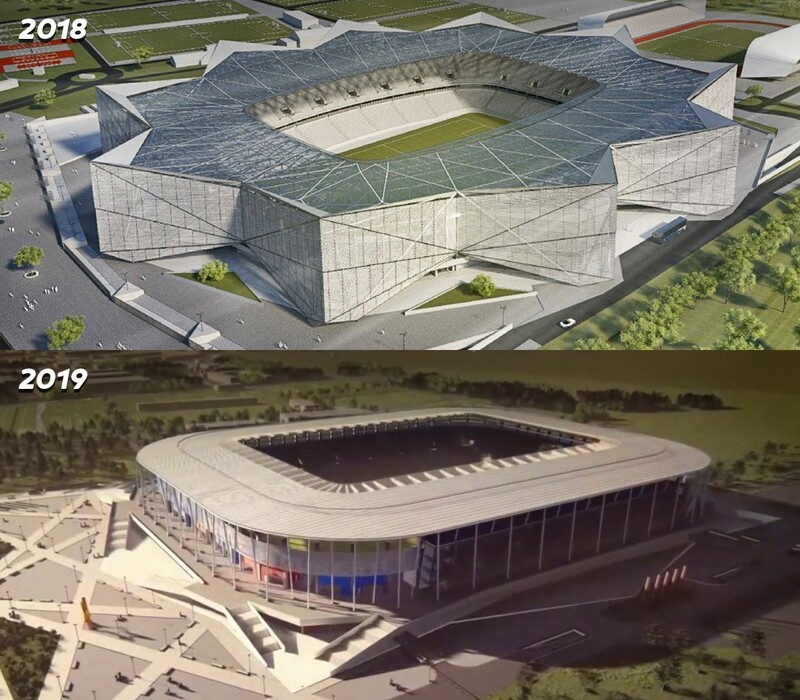 Presented in February, the updated design of Steaua stadium arrived at StadiumDB only in late March. New concept for the Ghencea stadium differs significantly from the vision officially presented in early 2018. The impressive star shape is effectively gone, can be seen only in the layout of outer plazas and promenades. Also gone is the outer skin, which means fans using sanitary and catering facilities will not be fully protected from the elements. Only a row of slanted columns will act as outline of the stadium, while the main stand is to be glazed. Such changes come as optimisation effort in order to speed up construction and make it more economically viable. Thus the drastic decrease in amount of steel used in the roof structure or replacement of polycarbonate by tin in roof cladding. The auditorium has been straightened (initially stands were to be curved slightly for improved sightlines) to facilitate prefabrication and installation. Though the final concept is less impressive than the first one by almost any measure, there are some areas in which it brings increases. Capacity has grown by roughly 700 seats to reach 31,254, while total surface increases from 70,000 to 82,000 m2. Now, you would think the stadium will thus come cheaper than the bold vision shown this time last year. But you would be wrong. The price tag is actually very slightly higher, at €64.5 million. Which isn't excessive for a stadium of this size, it was really more improper to suggest the initial vision could be delivered with such budget.